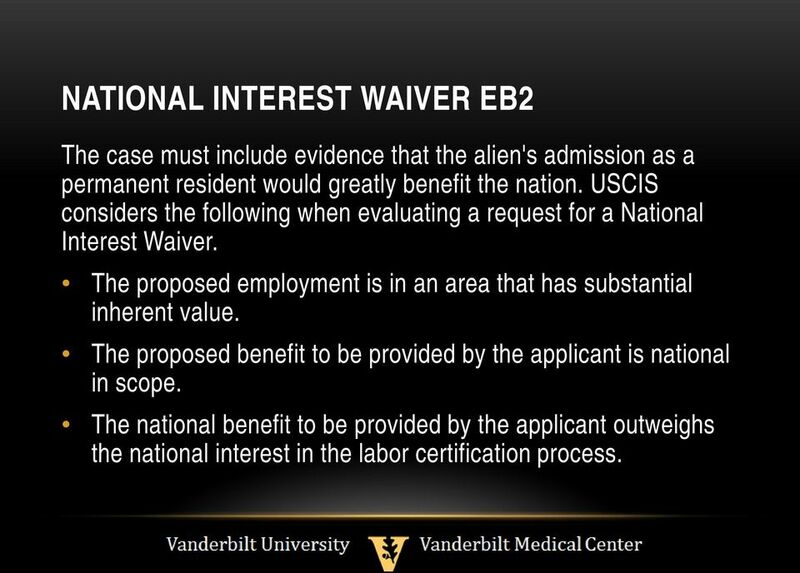 8 NATIONAL INTEREST WAIVER EB2 The case must include evidence that the alien's admission as a permanent resident would greatly benefit the nation. 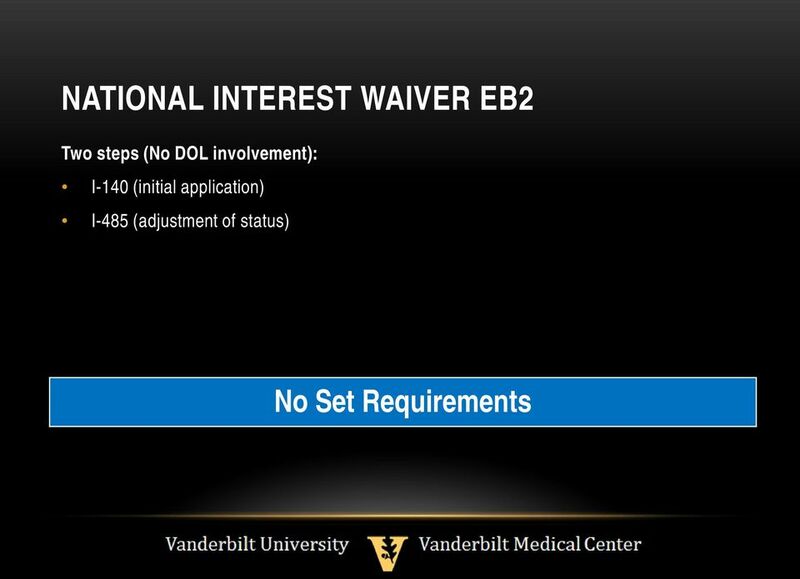 USCIS considers the following when evaluating a request for a National Interest Waiver. 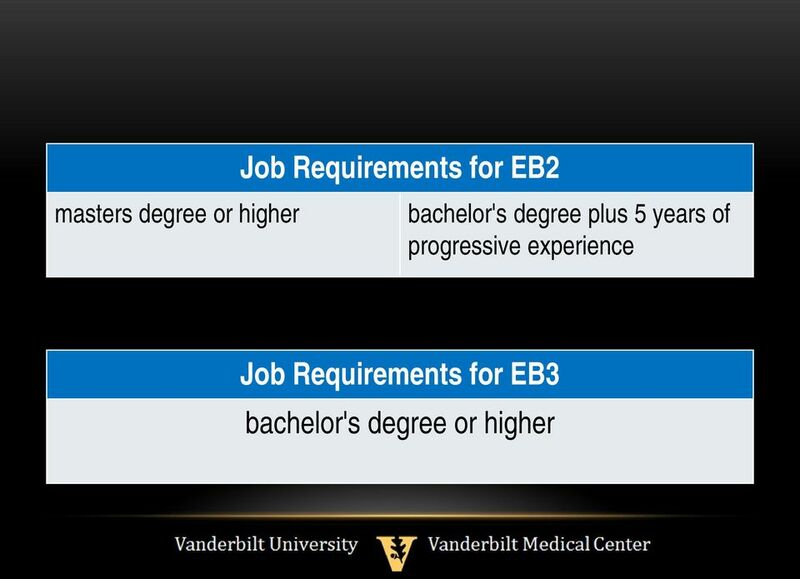 The proposed employment is in an area that has substantial inherent value. 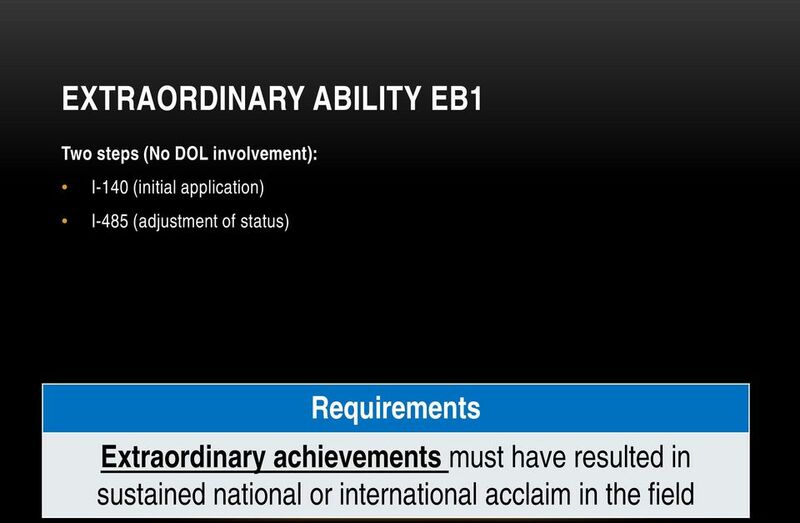 The proposed benefit to be provided by the applicant is national in scope. The national benefit to be provided by the applicant outweighs the national interest in the labor certification process. 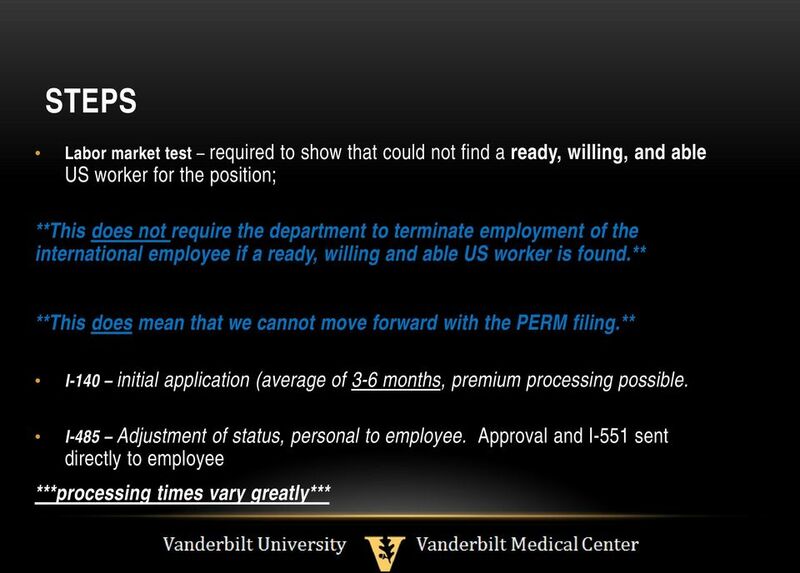 13 LABOR CERTIFICATION CONT. Basic Requirements 1. 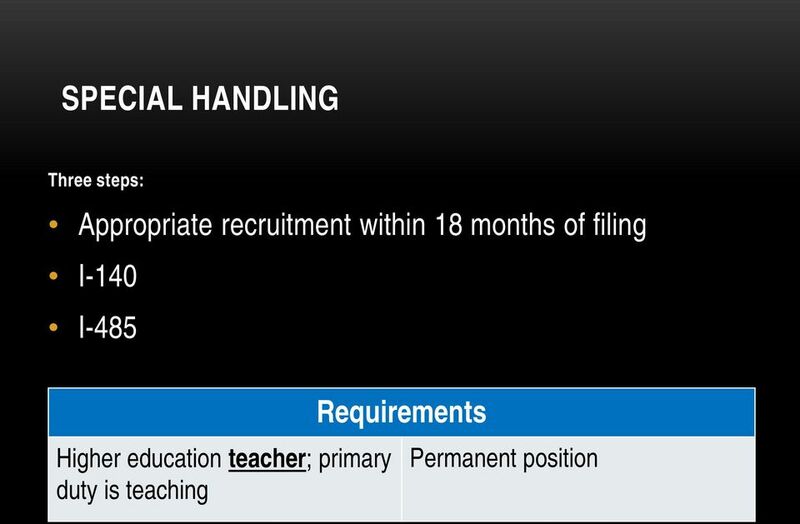 The job being offered must be a permanent position 2. 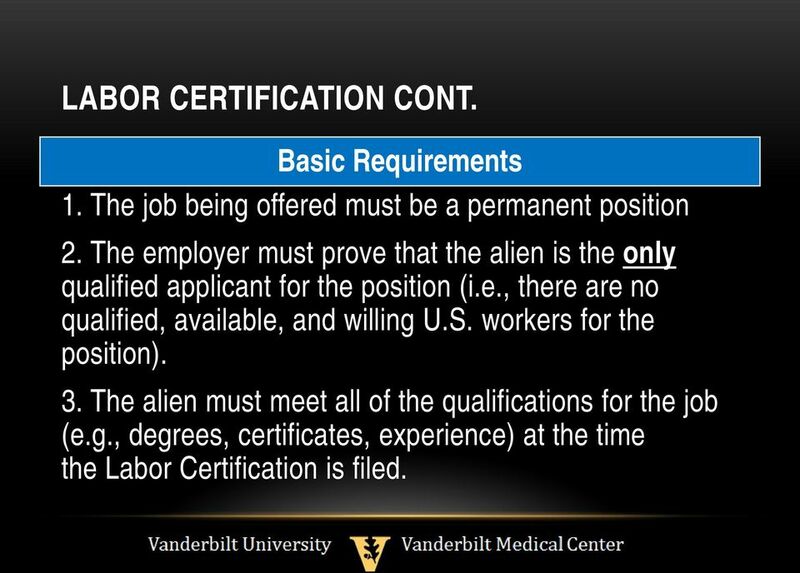 The employer must prove that the alien is the only qualified applicant for the position (i.e., there are no qualified, available, and willing U.S. workers for the position). 3. 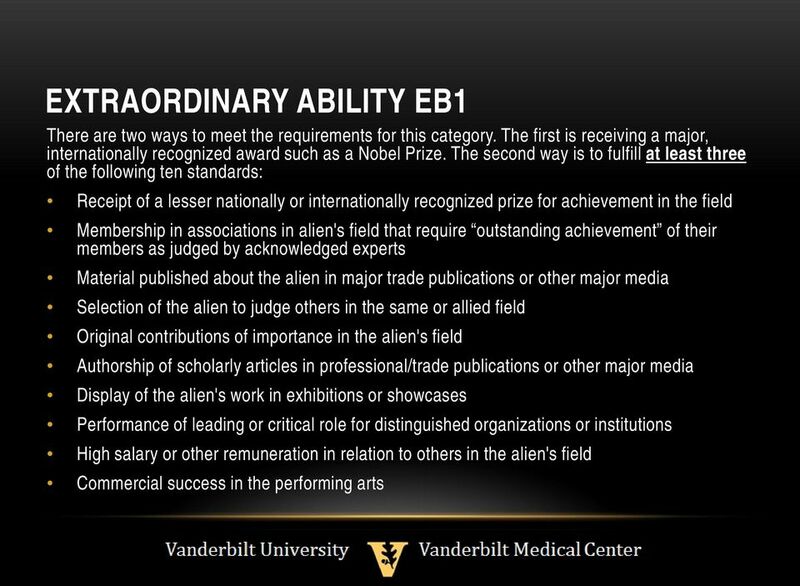 The alien must meet all of the qualifications for the job (e.g., degrees, certificates, experience) at the time the Labor Certification is filed. 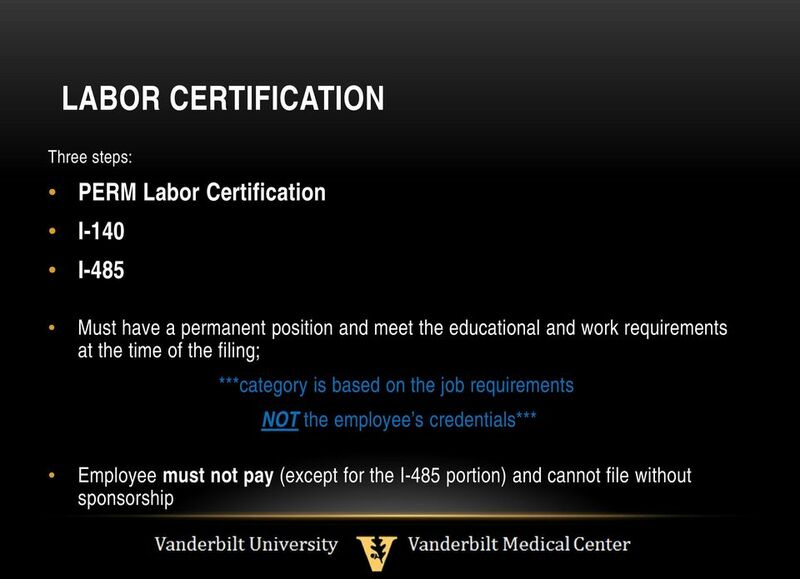 15 LABOR CERTIFICATION PROCESS 1. 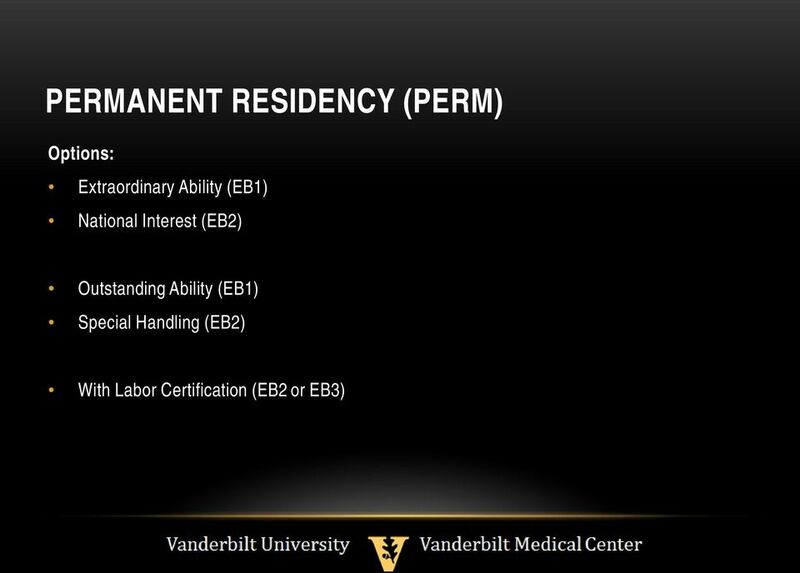 Complete the Case Initiation Request for permanent residency. 2. Meet with your Immigration Program Coordinator to discuss the permanent residency process and complete the Acknowledgement Form. 3. With assistance from your immigration program coordinator and immigration counsel complete the job description according to Department of Labor standards. 4. 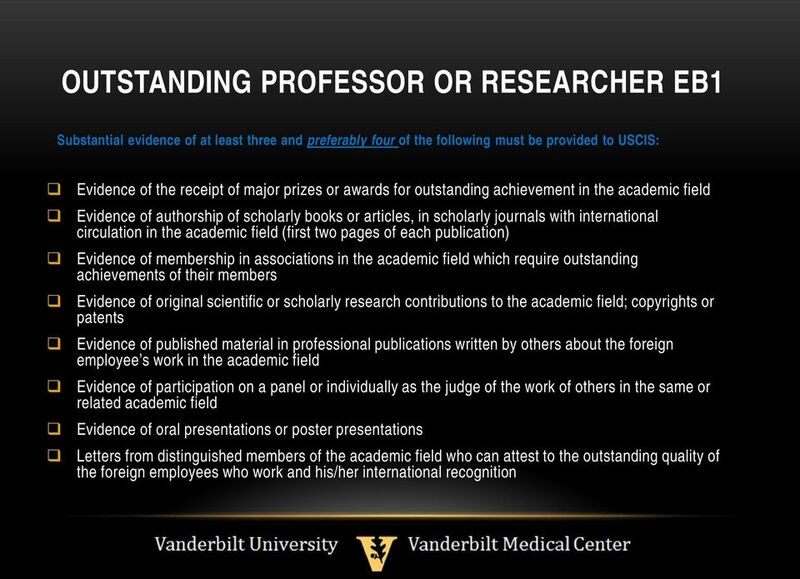 The applicant must provide evidence of meeting the criteria in the job description in order to proceed. 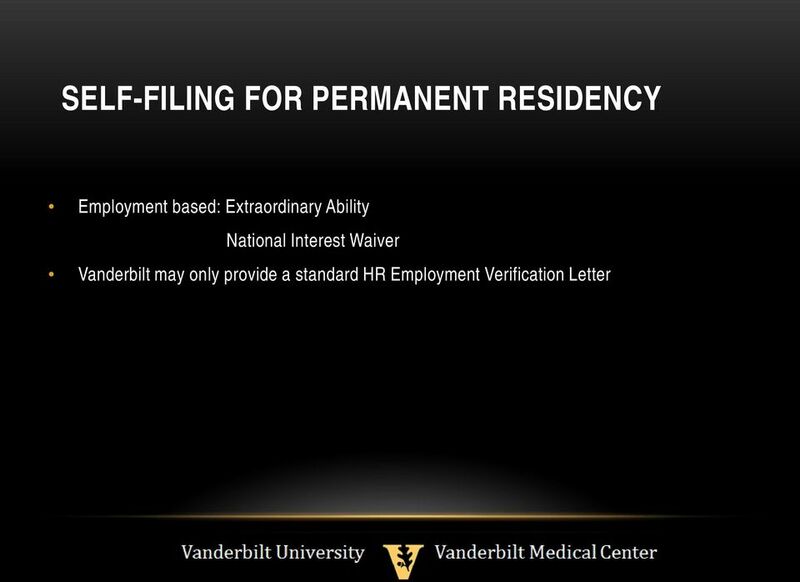 The applicant may not have gained any of the necessary experience or skills while employed at Vanderbilt. 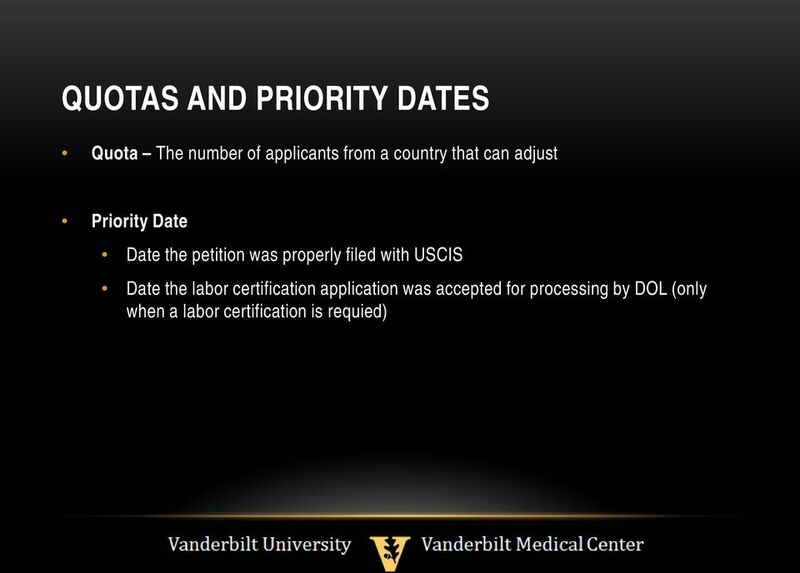 16 LABOR CERTIFICATION PROCESS CONT. 5. A Prevailing Wage Determination will be submitted to the Department of Labor. 6. Approve recruitment costs and post position in physical work site. 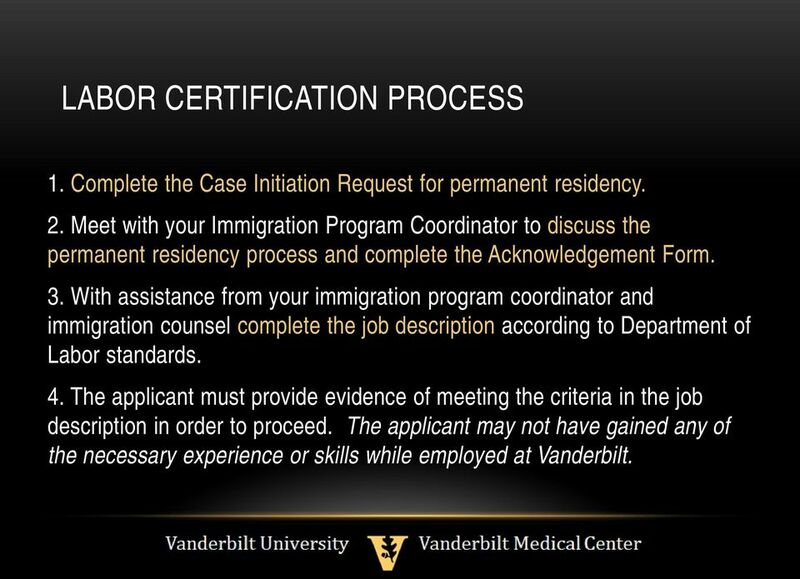 Your Immigration Program Coordinator with post the position on Vanderbilt Jobs if necessary. 7. 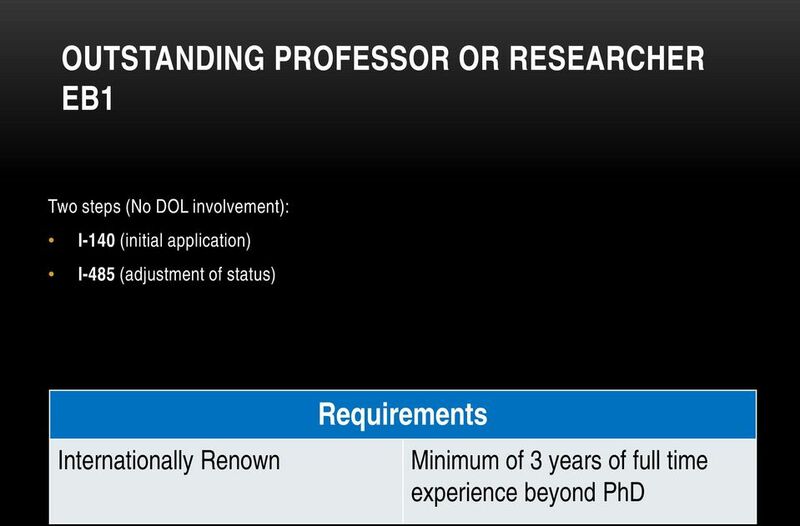 Evaluate applicants. Evaluations will be based on job description and an evaluation spreadsheet will be provided for you. 8. Labor Certification submitted to the Department of Labor. Typical processing time is between 5 and 7 months and cannot be premium processed. 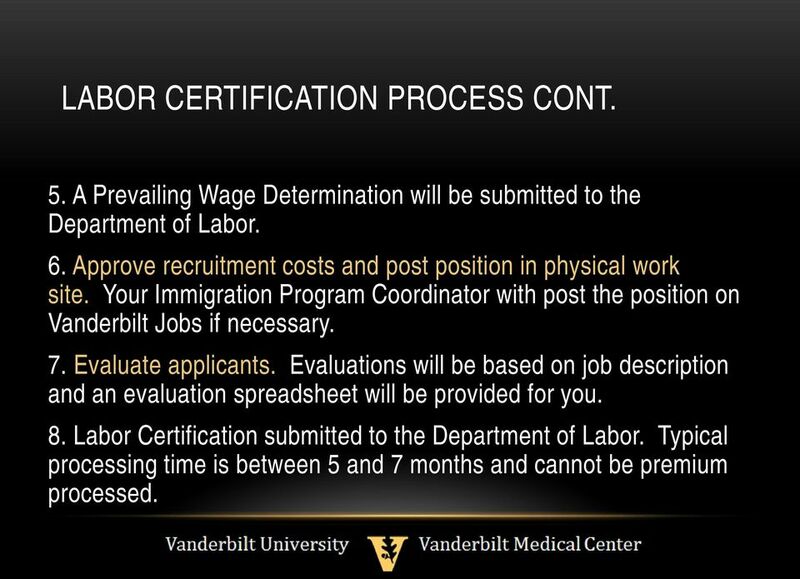 17 LABOR CERTIFICATION PROCESS CONT. 9. 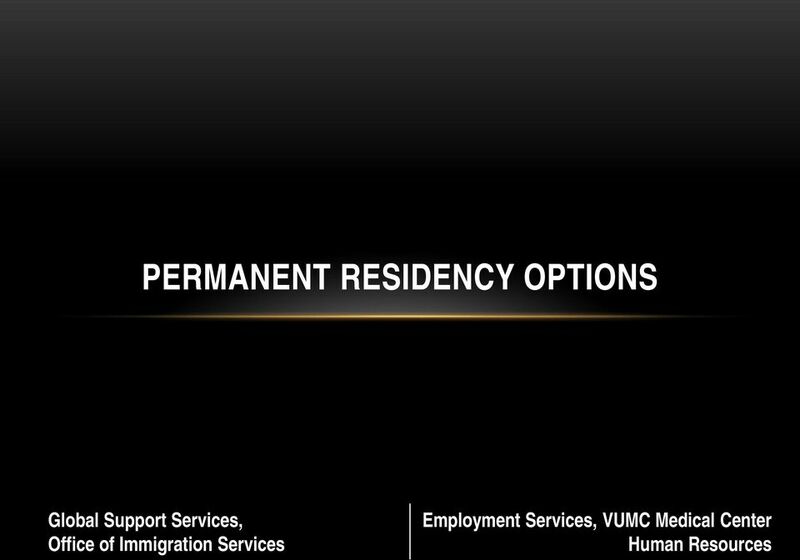 Application for permanent residency (I-140), along with the approved Labor Certification, submitted to USCIS. Processing times vary; premium processing is optional. 10. Adjustment of Status (I-485; to receive the permanent residence card) may be submitted concurrently or when the priority date becomes available. 11. 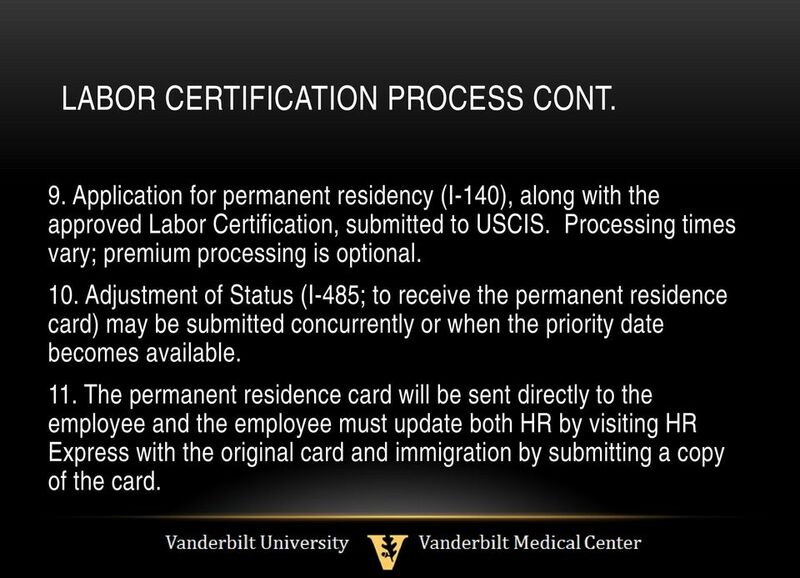 The permanent residence card will be sent directly to the employee and the employee must update both HR by visiting HR Express with the original card and immigration by submitting a copy of the card. 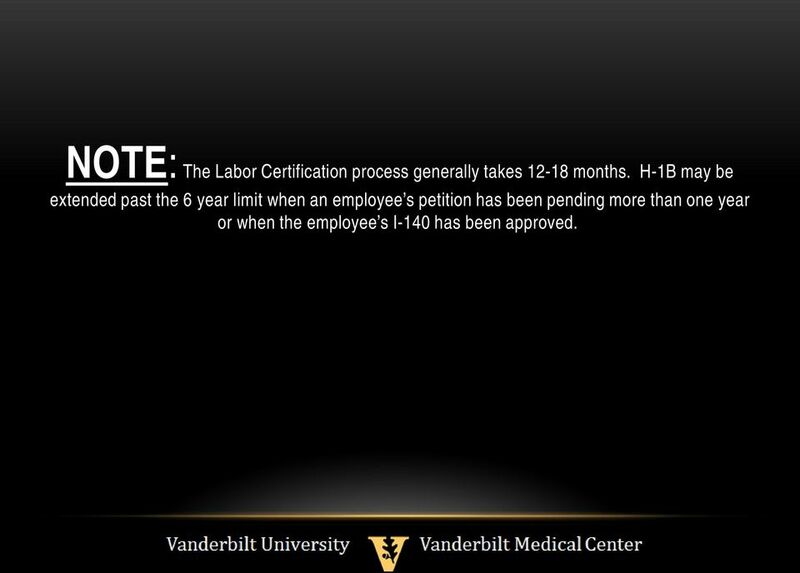 18 NOTE: The Labor Certification process generally takes months. H-1B may be extended past the 6 year limit when an employee s petition has been pending more than one year or when the employee s I-140 has been approved. Resident Resources. 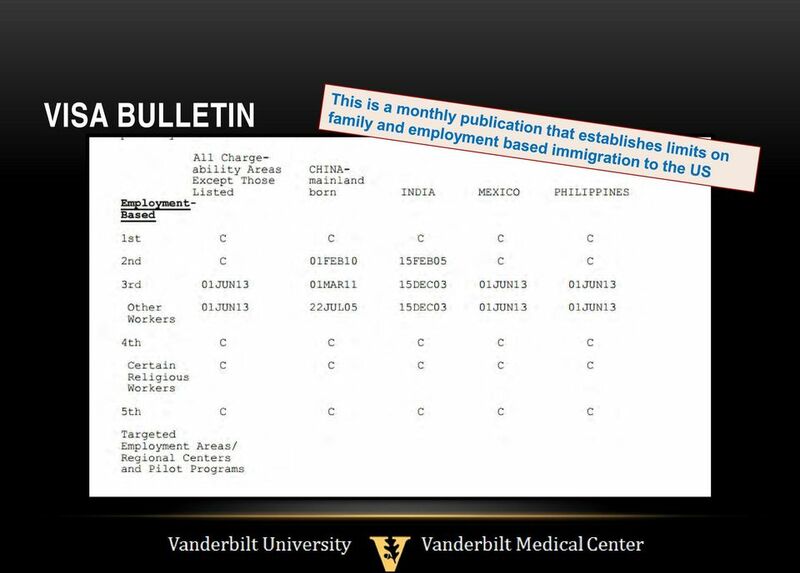 9 Critical Immigration Rules IMG Residents/Fellows Must Know to Practice Medicine in the U.S. J- 1 Residents and Fellows.